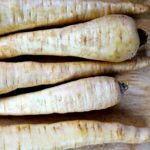 It’s time for another monthly produce challenge update! I know, I know, I’m late. It’s the 6th, but that still gives you plenty of time to try the veggie of the month at least 1-4 times. If you are late to the party, no problem. Just visit the intro post HERE and find out all the details of the challenge. You can start this challenge any time throughout the year. And, if you fall off at some point, you can always re-join when you are ready. I’m going to be trucking along as well as I can! February’s vegetable was cabbage. Red cabbage, green cabbage, napa cabbage, they all work. I thought cabbage would be a great vegetable to add to our diets because it’s very affordable. I probably buy cabbage just 5 times a year, so it’s a pretty rare vegetable in our house. 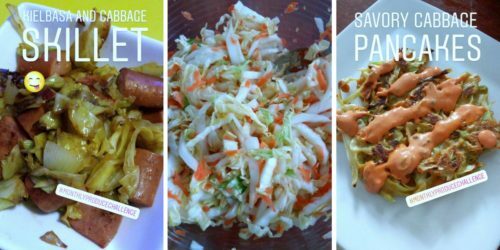 I wanted to use this challenge to see how we could add cabbage to our diets beyond coleslaw and the occasional cabbage tomato salad we make. Just because we don’t eat a lot of cabbage doesn’t mean we don’t like it. I think the reason why I rarely bought it and served it to my family was because I only knew of a couple ways to prepare it. When I’ve bought cabbage in the past it took us a while to get through a whole head, so I hated the thought of buying it and letting some of it go to waste just because I didn’t know what else to do with it. Cabbage Steaks are such a simple yet tasty way to cook cabbage! They are basically thick slabs of cabbage, roasted. For this recipe, you’ll need 1 (2 lb.) head of green cabbage, olive oil, garlic, salt, and pepper. Everyone, including my sister-in-law and father who happened to be at our house the night we ate these, loved these cabbage steaks. My husband doesn’t normally like cabbage cooked, but he thought roasting made them taste better. I think this will be a new side dish we turn to often! If you’re looking for a really easy lunch to meal prep, this is it. Instant Noodle Cups can be customized to each person’s tastes, and they are ridiculously cheap. I used Better Than Bouillon, sriracha sauce, and red curry paste to flavor. I added some cabbage, shiitake mushrooms, and shredded carrot to each mason jar. My kids and I were the only ones who tried these, and we all enjoyed them. I’d say my kids were bigger fans of the noodles and broth than the veggies, but at least they were exposed to the veggies, right? 🙂 My only real complaint was that I couldn’t find the right kind of noodles (Saifun were the ones I used, but the directions say to use Maifun or yaki-soba noodles). I prepped the cups ahead of time, but I didn’t add the noodles until right before we were going to eat them since I had to soak the noodles. This Purple Resolution Smoothie is one I’ve made before, but this time I had to change the recipe quite a bit (admittedly, I rarely follow smoothie recipes). When I made this smoothie for my family, my daughter and I were on a dairy-free diet and couldn’t have yogurt. So we left the yogurt out, and I think that made a difference with the texture. I also forgot to add a banana, another ingredient that could have smoothed things out. Our smoothie had purple cabbage, frozen blueberries, frozen raspberries, beets, spinach, and cranberry juice. The 5 year old didn’t care for the texture so she had a hard time drinking it, but the 4 year old loved it! I missed the smooth texture from a regular smoothie (one I usually add banana and yogurt to). I might have gone overboard on the veggies and maybe I’ll leave out the beets next time. I’m not going to lie, these Lazy Cabbage Rolls took a good amount of time to throw together. I spent time the day before I made it cooking the rice, slicing cabbage, grating onion, dicing onion, and grating a carrot. Then, on the day of I had to prepare the large meatloaves, if you will, and make the sauce to pour over it. 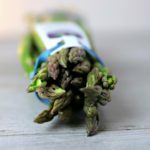 We try to keep all our meals during the week really quick and easy, but I wanted to try these for the monthly produce challenge, so I made an exception. They were a big hit overall. Leftovers were not as well received with the kids, but the first day they were really digging this meal. My husband absolutely loved it, so I’ll be adding this to our favorites list. Even though it takes some work, these Lazy Cabbage Rolls will be nice to have once or twice a year. 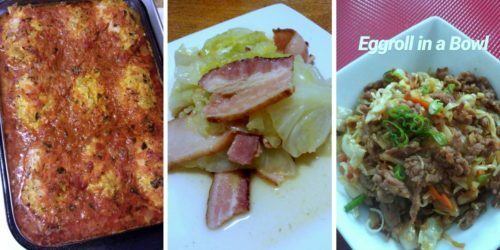 Irish Cabbage and Bacon was really easy to pull together. Unfortunately, my husband could not eat this due to the fat content. There is 24 oz of bacon in this dish! I wish I had made some boiled potatoes to eat with it. It made a ton, so if I were to make this again (probably for St. Patty’s Day!) I would cut it in half for my family (especially since my husband won’t eat it). My oldest child and I liked it, but my 4 year old and baby just liked the bacon. In fact, the baby was taking the cabbage and throwing it over the side of his tray and even tried throwing it at me once. :0 I blame it on the fact that he was super tired, but still. Eggroll in a Bowl is one of those dishes that you know probably could’ve been better. I thought I could get away using Italian sausage, but it made the whole dish taste too…Italian. It was kind of like a weird mix of Asian and Italian food. Also, I read the comments before making it and many people said that the recipe called for way too much soy sauce, so I cut it in half and I know it made a difference. All in all, it was a really simple meal to throw together. If you watch my InstaStories, you might have heard me complain about how many recipes say they take X amount of time, but often they end up taking me twice that amount of time. This recipe said it would take 15 minutes to make, so I timed myself. It took 20 minutes. If I had done as the recipe directed and started the meat first, I’m sure I could’ve pulled it off in time. My issue with this meal was that it probably wasn’t the healthiest thing I could have made. The sausage made it greasy, and I couldn’t tell there were any vegetables in it. All 3 of my kids ate the sausage. I think they all took several bites at first, but then one of my kids just decided to stop eating it and the other two pretty much finished theirs off. My husband didn’t eat it because it was too greasy. I liked it well enough, but I don’t think I’ll make it again. Yes, it’s a very quick meal to put together in just 15-20 minutes, but it’s not a standout. I am surprised I have never made Kielbasa and Cabbage Skillet in all my years of cooking. It’s majorly simple with loads of flavor. The outcome was just wonderful. My kids all loved the sausage, of course. My girls both ate some of the cabbage and onions and said they liked it. My 18 month old, on the other hand, only wanted the sausage! He only ate the onion and cabbage when I put some right behind the sausage on his fork so he couldn’t see it. He must have liked it or didn’t notice because he never spit it out. My husband didn’t seem to be a huge fan of this dish ,though. I think it is because he’s never really liked just steamed cabbage and it reminded him of that texture. I made Ginger Lime Asian Slaw as a topping for our tacos. It made quite a bit, so if I were to make it again, I’d definitely cut the recipe in half. Also, because I bought an entire head of napa cabbage (they are pretty huge!) I would definitely try and come up with another use for it before buying it. I wanted to make some kimchi, but I didn’t have many of the other ingredients and I’ve never actually eaten kimchi before so I wouldn’t know if it tasted right or not. My husband made an audible “Mmmmm” when he took a bite of his taco with the slaw on it. So I know he liked it. I also know that all my kids loved their tacos (they pretty much licked their plates clean), and my girls both wanted more even with the slaw. I thought there was a little too much ginger for my taste, but it was still really good, especially on the tacos. These Savory Cabbage Pancakes were actually quite easy to make. I was going to serve them with some chicken drumsticks, but then my husband told me he wanted to make cow tongue (yeah, I’m still a little squirmish when I think about it) that night so I just made the pancakes (and I was the only one who didn’t eat the tongue!). I doubled the recipe because the reviews on the blog post were quite stellar, and I wanted to make sure we had enough. I doubled the sauce, too, but I really didn’t need to. Also, I think I should have cut way back on the amount of sriracha sauce I added to the sauce. It was just too spicy for me, and I could only use a teensy amount on my pancake. My mother-in-law and sister-in-law were at our house when I made these, and they loved them. We all ate them and thought they were great. The only one I don’t know about is my husband. He was too obsessed with his cow tongue that day that he didn’t even try the pancakes. That, and I just asked him if he ate them and he said, “no, there was no syrup.” Riiiiiiight. I think he was trying to get out of eating them. I did try his cow tongue, so it would’ve been nice if he had tried my pancakes. Cabbage Roll Soup was easy enough to make, but it wasn’t as tasty as the Lazy Cabbage Rolls. If I were to make this again, I’d definitely cut it in half (unless we wanted lots of leftovers, of course). I had to put half of this in my largest pot and half in the Instant Pot because if I had tried to put it all in one pot it would have overflowed. My husband loved this soup (which is saying a lot since he doesn’t care much for soup). My girls liked it, but my 1 year old boy didn’t want anything to do with it. He’s so weird about soup. 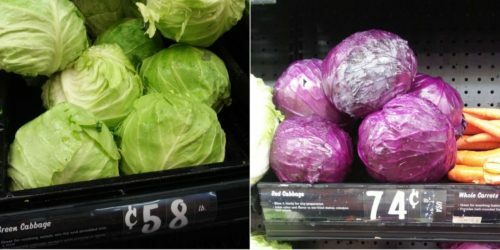 How Much Does Cabbage Cost? Cabbage is relatively cheap. It costs less per pound than I’ve ever seen broccoli. During the challenge, green cabbage ranged in price from $0.58/lb to $0.68/lb. where I live. Red cabbage was $0.74/lb, and napa cabbage was $0.88/lb. Overall, we spent $14.01 this month on cabbage for the 10 recipes we tried ($1.40 per recipe). When you are looking for a head of cabbage at your grocery store, choose one that is heavy for its size. Don’t buy it if you can see that the leaves are starting to come away from the head, because that means it’s not very fresh. When you bring home your cabbage, keep it in your crisper. If you cut into it, wrap it in plastic wrap or put in a plastic bag and let all the air out, and then use it within 3 to 5 days. A whole head of cabbage can last a while in your fridge, although if you wait for several weeks to use it, it definitely won’t be as fresh or tasty. (sidenote: my fridge freezes everything lately, and I had some cabbage in there for about a week and it had some signs of freezing. I was still able to use it, but I cooked it. I wouldn’t have used it raw, like in a salad). Whether you are making a salad with raw cabbage or cooking your cabbage, you need to cut into your cabbage to use it. 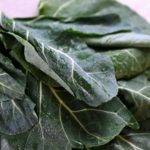 Remove the outer leaves that are usually a little torn and covered in dirt and then give the head of cabbage a good wash. For most recipes, you’ll need to cut the cabbage in half and remove the core. 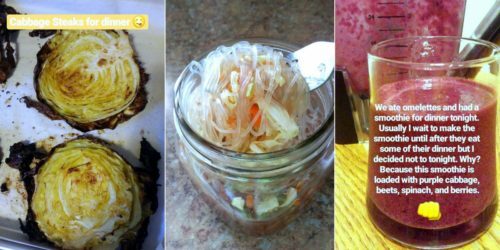 There is at least one recipe that you don’t need to remove the core (the cabbage steaks). For the rest of the recipes, you’ll likely need to shred it or cut it into smaller pieces. 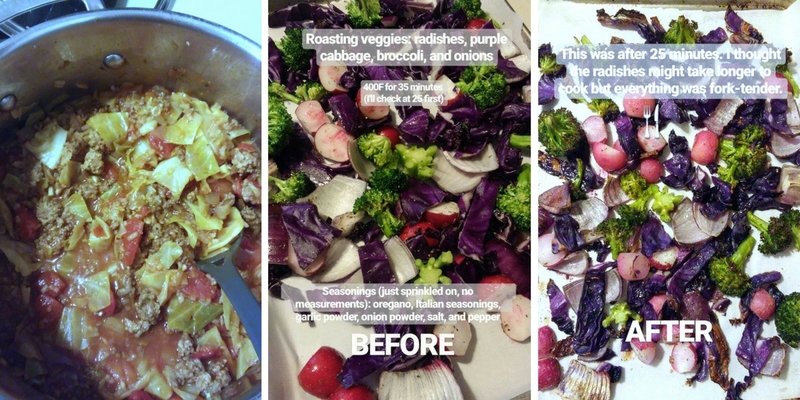 Red cabbage and green cabbage have different nutritional benefits. It makes sense since they are different colors. For example, red cabbage contains lots of vitamin C, but green cabbage is a great food to help prevent type 2 diabetes. There is a lot of interesting nutritional info about both, so if you want to know more, check out more HERE (for green cabbage) and HERE (for red cabbage). March is the perfect time to eat green, springy vegetables (because St. Patrick’s Day AND Spring 😉 ). So this month we’re going to add collard greens into our diets. 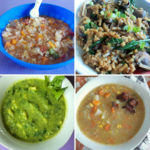 I found several recipes to try and have already added them to our meal plan this month. You can follow along by subscribing below or following me on Instagram (be sure to watch InstaStories, too!). If you want to share a picture of your meals on social media, be sure to use the hashtag #monthlyproducechallenge. I am excited to find out how everyone is using the veggie of the month in their family’s meals! Want to Eat Better this Year? 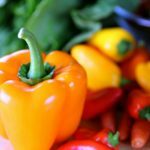 Join the Monthly Produce Challenge! 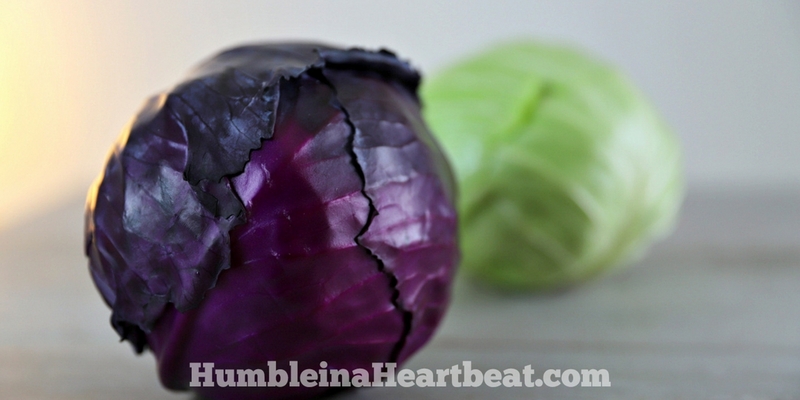 Cabbage is extinct at my house– never bought it! The Eggroll in a bowl looked pretty good. 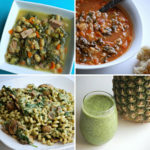 The other meals looked…interesting, but I’ve never been adventurous! I know where to come when I decide to cook cabbage!